I am the Chridmeister. This is my old stuff from years ago! Why not play some games, watch some animations, or read the old abandoned blog. Patch's Parp Pandemonium is a panda fart simulator. 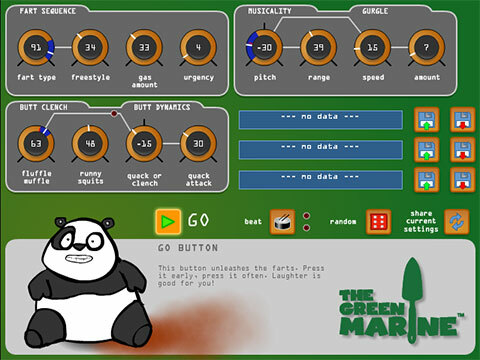 It combines hand crafted fart samples with analogue modelling synthesis to create a rich, warm panda fart experience. Click here to visit Patch's Parp Pandemonium at The Green Marine's website. OH SNAP!!! Arse Race Tshirts are BACK!!! After a long abscence, Chridmeister merchandise is back! Now you can finally buy that Arse Race tshirt that you've been hankering after. Arseteroids is rather like the classic Asteroids game but with arses in space! Oh, and there are alien flying saucers who shoot boxing gloves at you. According to a focus group of gerbils, it's funny and addictive! Click here to play ARSETEROIDS! Free Web Award for your site! Is your website not bad? Kind of OK? Really quite acceptable and somewhere near reasonable? Please feel free to add this MYSTERY CARROT AWARD to your website! Simply copy and paste the HTML below, onto your web page!